It’s a tough week here. It is the end of the trimester and sadly, even middle school students feel the stress. We are also two weeks into an eight-week stretch without a break. With 10 more students per class than I’m accustomed to, I’ve also learned that I’m absorbing more stress from them as well. Sometimes I feel as if I am in the room in the center of a house fire when the room is full. And it is about to ex/implode at any moment. That’s not what kids deserve. And frankly, I’ve feel like I’m not what the kids deserve this week either. But I’m what they have. So I’ve been looking for a way to stay calm. I have tried to see myself as a tennis racket this week. Weird I know, but bear with me. The tennis racket doesn’t get to sit still during a practice or a game. Even when the other player is dealing with the ball….the racket is poised and just slightly in motion…ready to return the play. I realized that I did not have to be the entire racket…and that I could chose, at any, or every moment, which part of the racket I could be. Professionally, and personally, I often have to be the strings. I have to catch the boll. I have to return the ball so that the players can hit it back to me. But this week…..I’m trying to be the spaces between the strings. The spaces don’t have to do anything. They just have to be there. They let everything go by. They let the racket move and the strings do the work when necessary. It helped me so much. There is a time to be the strings….but it was a good week to be the space. I hope it helped the kids as much as it helped me. All three classes need a lot of work with the basics. The first class was able to arrange itself in a circle without too much fuss and I led a series of questions/directed a conversation around several of the students. There is a boy in the class. His name is ________. He is very, very famous in Spanish class. He has a lot of friends. One of them is also in Spanish class. His name is ___________. He is very, very intelligent. ___________is another student in class. He is very athletic. He likes football. Many students in the class like football. ____________ has a football jersey. Her favorite team is __________. and then one of the kids ran to his backpack, pulled out a Seattle Seahawks jersey and put it on!! Great class. We are still pausing (often) so they can settle down, focus, stop talking, etc….but it was progress. I felt pretty good about how that went! The next class? Ummm. Different story. They could not handle a change in the seating arrangement. When I tried to start the conversation about the class, we could barely get started. The social make up of this group is a study in middle school insecurity. Everyone is trying to be cool and the socially acceptable way to be cool is to make sure that everyone in the class knows that you are cooler than they are. Cliques, sarcasm, eye-rolling, snorts…you get the idea. Lovely individuals on their own. Toxic when together. So…..back to the drawing board. In the middle of class. Ok…twenty minutes into a 90 minute block. Desks in rows. Take out a sheet of paper. I write a sentence about Prince Royce (on the computer, projected onto the screen). The students write the sentence in Spanish. I ask individual students comprehension questions. No one else is allowed to speak. On the outside I am neutral, calm, maybe even cold. On the inside I am frustrated and fired up!!!! This is BORING. SUPER, SUPER BORING. But….the class itself was under control. The individuals in the class could each employ self-control. The language was comprehensible. a) Prince Royce is an actual human being and I wouldn’t let them mock him, or anyone else, in my presence. b) Prince Royce is a professional. He has a job. He might be told what to wear and how to cut his hair, etc. etc. It is not our job to do either of those things. And then we went back to the video. What color is his shirt? What color are his shoes? Do the shoes cost a lot of money? Do his fans like his shoes? Using the same, one student at a time, no one else is answering, and we write the answer on the screen and they write it in their notebooks scenario. The same material. Completely different lessons. The hard part? Not putting my own personal label on either one. I was totally miserable during the second lesson….but truthfully…it was probably the right lesson for that group. If I had tried to keep pushing 5th period’s lesson on 7th period, it would have gotten very, very ugly. Tomorrow I meet with the third 6th grade class. It’s the most challenging one!!!! I’ll keep you posted. Right now I know the material, but I haven’t yet nailed down the lesson plan…. The following was a response to a dialogue on Ben Slavic’s blog and several folks suggested that I share it here. The conversation centered around the challenges of teaching students towards the end of the year! Part of the reason that April/May are tough is that the kids that we have now are not the same students that we have in August/September. They have different interests, different skills and sometimes different friends and even family. This is a great time of year to acknowledge that! Get to know them all over again. Reconnect. It is also a good time to “step up the game” and introduce new activities that are more in line with their level of acquisition and maturity. There is no standard way to outline this because each school is so very different. If I were teaching a Level 1 class of 7th graders I might start using topics like part-time summer jobs (babysitting, lawn mowing, etc.) that kids have in this area. I might start creating stories about 8th grade and all of the advantages they will have next year. I might start to introduce any kind of real person connection to the language that their squirrellier 7th grade selves might have dismissed. If I were teaching a Level 1 class of 9th graders I would definitely start incorporating summer jobs, summer concerts, and summer clothes…..which would lead into a story about the dress code, which will soon be a big issue for our freshmen because it is a big deal at our school I would ask about what next year’s freshmen will need to know, and create a BB, or PP or letter for the incoming freshmen. At any level, if you haven’t started an FVR (Free Voluntary Reading) time, this is a great time to do that….if you have the materials. In my level 3 and 4/5 classes they get 20 minutes 2-3x per week to choose their own activity: read novels, children’s books, cloze activities with lyrics to songs that we have done, write a story, take a practice quiz (similar to one section of the final and check with a key), read articles that I have ripped out of People in Spanish, or whatever else I can come up with. They start each 20 minutes with a grade of 100. Every time that I see that they are NOT engaged in the activity at hand, I subtract 10 points from their grade. Even my rowdiest can keep it together for 20 minutes IF they are choosing their own activity (and are not sitting near a friend!!) I play music quietly in the background and it is a nice, well-earned change of pace. The skills that are most needed are the ones that you use in your class to complete transitions and to refocus. Reteach and practice those. Allow 3 minutes here and there for just heads down and silence. Life is crazy for us all this time of year. Many of you know that I teach in a small, rural district in upstate New York. 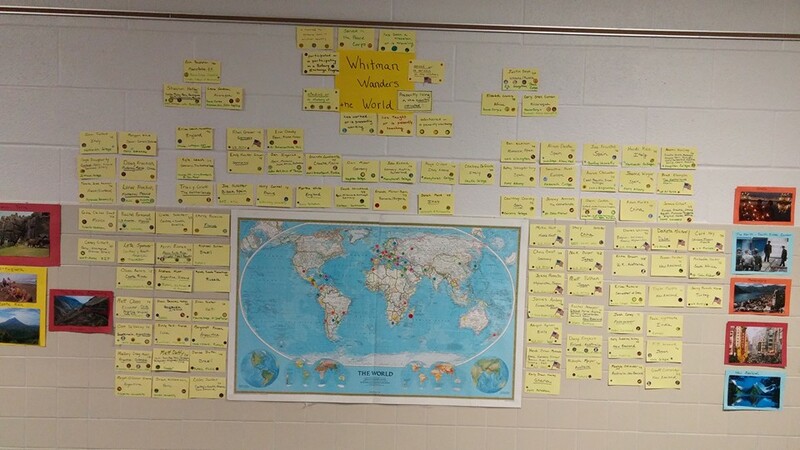 A few weeks ago our department began to build a display entitled “Whitman Wanders The World”….and it has been such a joy to work on! 1. 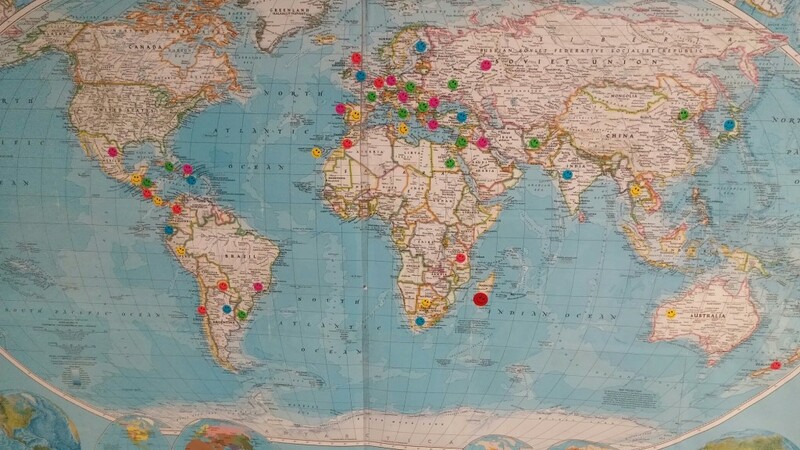 We made a list of all of the students that we could remember who had studied abroad, volunteered for the Peace Corps, been stationed overseas, etc. 2. We put out a call on Facebook for former students to share where they had been. We labeled each card with a sticker that identified how the graduate had travelled: a flag for military service, a star for study abroad, a blue dot for working, a peace sign for Peace Corps, a red dot for Rotary etc. 4. 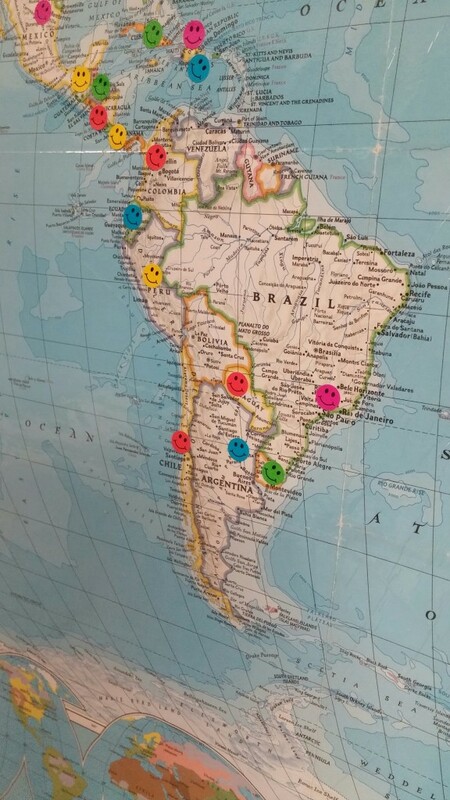 We used a laminated world map and put a smiley face on each country/territory that a Whitman grad had set foot on. 5. 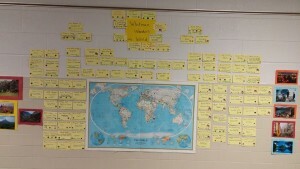 Then we simply arranged the cards around the map. It isn’t high tech and it is all hand done…not a fancy project, but definitely a heart-felt one. Since the pictures have been posted we have had folks send us even more information so now we have more cards to add!! Our next step is to add blue cards for where staff have studied/ worked/ etc. It has been so fun to watch the students’ and staff’s reactions to the board. Because so many people stay in the immediate area, and the folks who leave often stay gone, it is really eye-opening to see who has been where!! I hope that helps any of you interested in this project for your school.